Eight years ago Oaxacan immigrant Sara Garcia decided she could no longer ignore the power of Holy Death. Garcia claims the Mexican folk saint, known as Santa Muerte, brought her out of a coma, then instructed her to found a church. 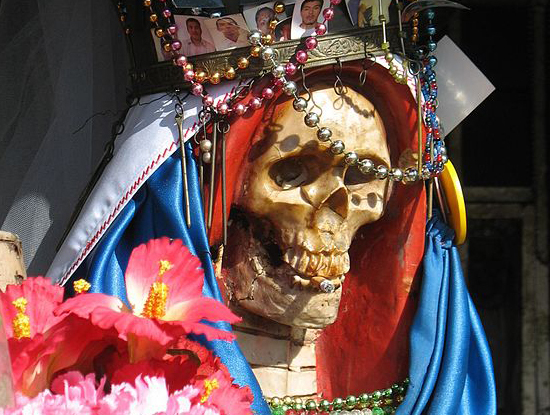 Garcia followed orders, taking up the missionary cause and opening Templo Santa Muerte, a storefront church on Melrose in praise of Our Lady of the Holy Death, in 2006. The symbol of a menacing skeleton clutching a scythe looks as if it had been invented for the cover of some 1980s heavy metal album, but the belief in Santa Muerte dates back hundreds of years. Contemporary devotees have depicted her on canvases adorned in robes of every color and on items ranging from coins and crosses to peacock feathers and satin. Holy Death, they believe, can conjure love, rid a home of envy, and bestow miracles. Faith in her has surged in popularity amid Mexico’s barbaric cartel wars. Traffickers, especially the fearsome Zeta cartel, erect shrines in her honor, asking for protection for their nefarious escapades. Smugglers in particular seem to curry her favor. In Phoenix, where kidnapping among Mexican criminals is rife, police report that they frequently find shrines to the Skulled Lady in stash houses. Garcia has crammed her space with prayer beads, candles, and special water that is purported to purge anger and anxiety. Also in the shop are magnificent statues of Santa Muerte, some as tall as five feet, clad in Renaissance princess-style garb or draped in white satin with a pregnant belly. Services are held on Saturdays and Sundays at 7 p.m. “Knowledge of death helps us to be better people,” she says. “You recognize your errors. You see humans as brothers. You start to see plants and animals the same way. Death treats us all the same.” » 4902 Melrose Ave., Mid City, 323-462-1134.